When summer arrives in WNY, we Buffalonians try to hold onto it as much as we can. After a long winter of freezing temperatures and lake effect snow, there’s nothing better than getting outside and enjoying the fresh air, warm breeze, and a backyard barbecue on your brand-new custom deck. Lacking the last part? Not to worry; 3 G Construction Inc. of WNY is here to help you design and build an outdoor living space your family will love, and neighbors will envy. Building a custom deck, patio, or pergola is a great way to add more living space to your home, enhance the look of your yard, and provide your family with new recreation opportunities. Your backyard could become your new sanctuary with a new deck built by 3 G Construction of WNY! Let us help you create a space for entertaining friends, communing with neighbors, or escaping the stress of daily life to relax with your family. Many WNY homeowners think building a deck is an easy DIY project. Little do they know how difficult it can be to do it well and create something that will safely last for many years to come. A quality deck should fit your needs and integrate beautifully into the home’s existing design. It should also be made from quality materials that will withstand the unpredictable WNY weather, and constructed at the highest standards to add value to your home and life. 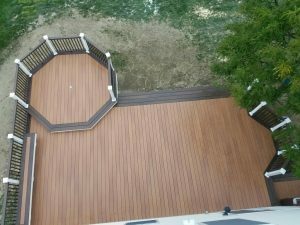 Design services for your new deck that incorporates your aesthetic and functionality preferences. Advice on which materials will work best for your outdoor project. Knowledgeable contractors with years of experience. A new deck built to last from start to finish. Whether you have a specific deck style or materials in mind or are just toying around with the idea of a possible new space, we’ll work with you to design the outdoor space of your dreams. 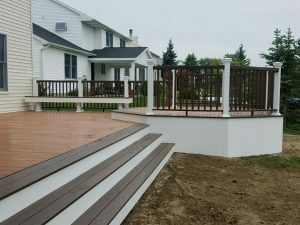 To speak with a custom deck and patio builder in North Tonawanda, NY, call 716-550-0659 today and receive a free estimate.